The Black Twig Pickers are a group defined by their forward thinking approach to a type of music most often associated with times gone by. Over the course of eight full-length records, including collaborative releases with Jack Rose and Charlie Parr, a split LP with Glenn Jones, and numerous EPs and singles, the group has established itself as a collection of dedicated practioners of old time music re-cast and shaped by their appreciation of modern improvisation, drone, and punk. While not at odds with the experimental scene that has fostered them or the old time circles they travel in, The Black Twig Pickers thrive in the middle of those two worlds, proving that the exploration of sound and the exploration of decades old tradition and community aren’t as different as one might think. 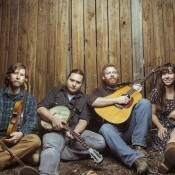 The Black Twig Pickers is an Appalachian old-time band consisting of Mike Gangloff on fiddle/banjo/jaw harp/vocals; Nathan Bowles on banjo/percussion/vocals; Isak Howell on guitar/mouth harp/vocals; and Sally Anne Morgan on fiddle, flat foot dancing,square dance calling, and vocals. They come from Shawsville and Blacksburg in Montgomery County, Virginia and Lewisburg in Greenbrier West Virginia. The Black Twig Pickers have recorded on labels including Thrill Jockey, VHF Records, Klang and Great Pop Supplement among others.